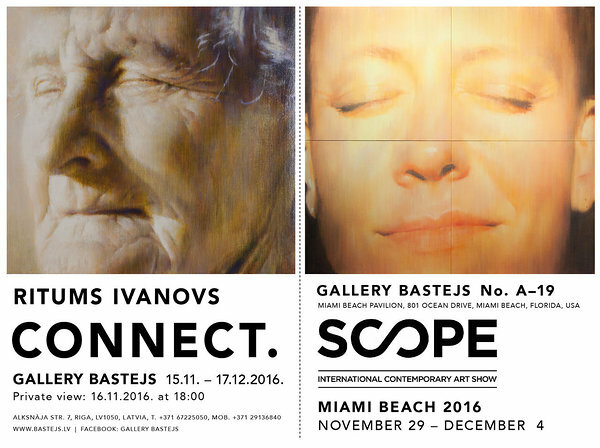 From November 29 to December 4, Ritums Ivanovs new works will participate at the prestigious international art fair SCOPE Miami Beach (FL, USA) in cooperation with Gallery Bastejs, Riga, to welcome over 55,000 visitors over the course of 6 days. Ivanovs exhibits works in various formats exploring the global nature of consciousness through personal experience gained by practicing meditation. The artist taps into the ideas of expanding consciousness. Simultaneously, works from the same series are displayed at Ivanovs' solo show in Gallery Bastejs until December 17. SCOPE taps into the cultural psyche to present only the most pioneering work across multiple creative disciplines. It is a high-level international contemporary art event, which offers innovative work and anticipates the latest trends in art. Miami Art Week happening at the same time with Art Basel Miami, is a global art show, attended by more than a million art lovers, collectors and influencers. Featuring 135 international galleries from 31 countries and 77 cities, SCOPE Miami Beach will welcome over 55,000 visitors over the course of 6 days. Amidst an unprecedented outpouring of critical acclaim from press, curators and collectors, and a digital and social media outreach campaign garnering over 450 million impressions, SCOPE Miami Beach is once again poised to lead the charge for the contemporary art market. Arterritory studio visit before "Connect"